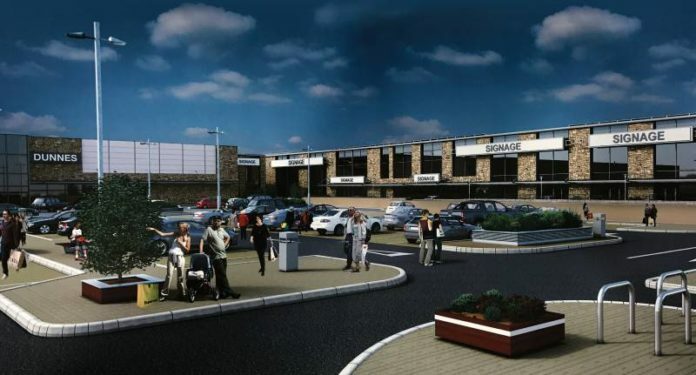 The new owners of the Gateway Retail Park in Knocknacarra have drawn up fresh plans for the €20 million Phase 2 of the development – which will include new retail units, gym, offices, restaurant and creche. Targeted Investment Opportunities ICAV (a joint venture between investment funds managed by Oaktree Capital and Sigma Retail Partners) have abandoned plans for a primary healthcare facility in the development, which they say is not viable. The group has now lodged new plans for Phase 2 with Galway City Council – on the 3.8-acre site of the excavated ‘hole in the ground’ beside Dunnes, which has been reduced to two storeys from the three and four storeys originally approved. The building will be a total of just under 12,000 square metres and will include six retail units, a creche with external play area, café/restaurant, and a first floor gym with offices. There will also be a new pedestrian link created running through the site, connecting it to Bóthar Stiofáin. The plans also include 129 basement parking spaces, 22 surface spaces and 116 bicycle spaces. The applicants have also indicated that Phase 3 – the full details of which have not been drawn up – will include space for a farmers market, a cinema and possible student accommodation. “The new owners in examining the permitted development and looking at the potential to attract a mix of tenants have discovered that the primary healthcare centre on the upper two levels is not viable and the space cannot be converted into marketable offices given that there are more suitable sites immediately adjacent, that would have their own ground floor presence.